The 2018 Magic Lens Africa Film Academy Awards of Excellence aimed at honouring distinguished Africans that have contributed immensely to the progress of the movie industry in Africa is taking centre stage again with a new addition of pageantry. 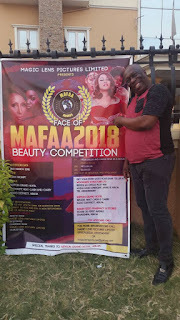 The yearly event where Awardies come from all over Africa seeks to get a face or an ambassador that represents the brand as a beauty queen hence the need to stage pageant contest opened to contestants from different African countries. The event which is also regarded as ‎night of the stars ‎is flagging-off Face of MAFAA beauty competition to mark it's 3rd edition as audition holds 2nd of March 2018 by 10:00am prompt at Nippon Grand Hotel, opposite Next Cash and Carry, Kado District, Abuja. The project which is put together by Magic Lens picture ‎limited, a brainchild of veteran actor Charles Awurum will have the winner go with N500,000 and a lead role in a movie (Mother Africa), 1st runner up gets N100,000 and 2nd runner up compensated with N50,000. Forms are already selling like hotcake as countdown for audition continues.